Fruits and nuts as nature’s gift replenishes not just our body, but inspires Belinda to create her magnificent jewellery collections. Composing her designs with ravishingly budding orbs of pearl and gold, her pieces are as eloquent as a fine piece of jewellery can ever be. Deriving from Belinda’s love for natural pearls, she had given new life to the classic combination that is, pearls and precious metal. In her new collection, she experimented with scale and juxtaposition of elements. Viewing from the front, bulbous pearls glimmers under light; from the back showcases the smooth metal finish, a sign of master craftsmanship. Inspired by flowers, fruits and other floral motifs, the designer articulates precious metal to imitate budding blossoms. 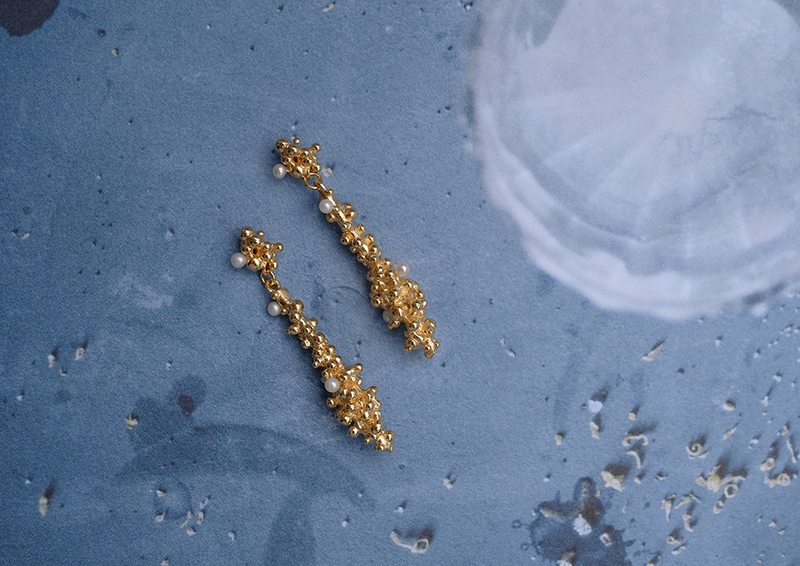 The series of work shows the appreciation for mother nature; drawing parallels between the careful nurturing needed for plants to fruit and the dedication for making a piece of jewellery. The aesthetic value of the pearl series is created with the combination of the contemporary used of pearl and the simplicity of jewellery form. The minimal and gentle form offers customer a new visual and wearable experience. Tactility born from the cactus family, this collection explores the tactile possibilities of contemporary wearables. Pertaining to the Designer’s floral motifs that threads all of her creations, Cactile Collection takes inspiration from the scabrous surface of cacti. Knots necklace demonstrates simplistic beauty at its best. The delicately placed gold knots sparkles among oxidised silver tubes, the composition also creates flexibility, allowing the necklace to sit fluently along the neckline. Swirling in endless spirals, the graceful curves. The 18k yellow gold hardware is moulded to twist around a string of freshwater pearls like a streamer for a playfully sophisticated aesthetic.